Siri Coming To Your Mac? Move over little paper clip man it looks like Apple may finally be looking at bringing Siri, the iOS digital assistant to Mac OSX environments. Technobuffalo reminds us that earlier this summer at the World Wide Developer’s Conference Apple introduced the world to Yosemite. Now Yosemite is in public beta mode but absent of any indication that Siri may be making her way to Apple’s desktop operating system. Imagine how awesome it would be to ask Siri to find or open files with your voice. Maybe you could get her to execute an easy process via desktop or send files to your iOS device with all of the new collaborative features in Apple’s latest desktop OSX update. While that would be cool, it hasn’t been on the table. A patent reported by Technobuffalo and originally discovered by Apple Insider, suggests that Apple is at least kicking around the idea of adding Siri to it’s desktop environment. For the past seven years Apple has been using their mobile devices as a gateway drug of sorts to the Apple ecosystem. Apple’s iPhone and iPad are two of the most popular mobile devices in the world and Apple’s computer business is on a slow but steady incline. This is one of the reasons Yosemite gets even more collaborative with iOS. Bringing Siri into the mix just makes sense. 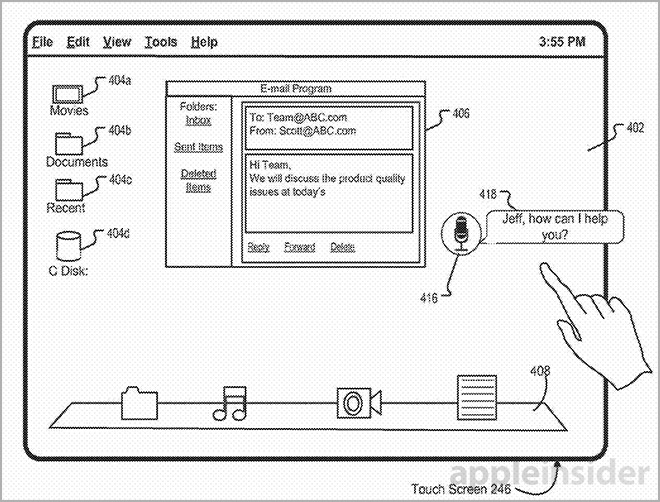 Apple’s recently revealed patent, “Intelligent digital assistant in a desktop environment,”. The patent pretty much details exactly what you would imagine it would be like if Siri was on a Mac computer. A microphone is seen in one of the patent images and asks “How can I Help you”. Siri for Mac OSX would operate similarly to the way it does on iOS. It would be powered by an off-site Siri server and could even run in the background possibly waiting for a verbal cue similar to Google Now, a feature forthcoming in iOS 8. “Voice input is of specific importance to the patent’s disclosures, as the technology is looking to augment keyboard and mouse input, or in some cases replace the physical tools altogether. The usual answer/response method seen with Siri for iOS is applied to the desktop variant, though more advanced operations can be performed given the extra computing power afforded by a proper computer.” Apple Insider reports. On forums and reddit the notion of having Siri available on OSX has been met enthusiastically. Home theater enthusiasts are excited about the idea of implementing the virtual assistant in an upcoming Mac Mini, a computer often used to control home theater environments.